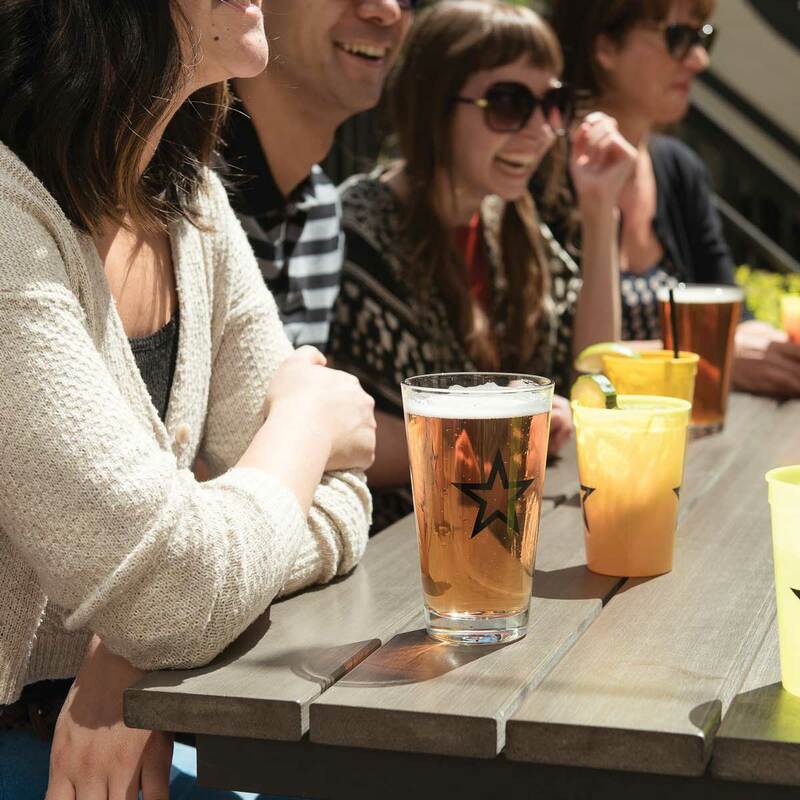 Watch the world go by from the shade of one of these patios, with a drink in hand. 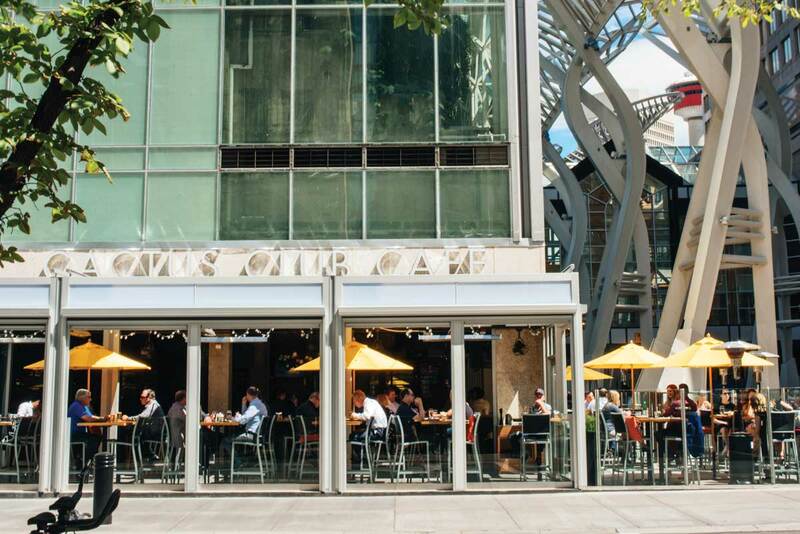 Located outside The Core on one of the busiest stretches of Stephen Avenue, the glass-enclosed sidewalk patio at the downtown Cactus Club puts patrons in the heart of the action. Ideal for sunny day business lunches or after-work drinks, it’s equipped with both umbrellas and heaters. And the brand-new patio at the Barlow Trail location now has an operable glass wall and fixed-glass roof system that allows it to be an indoor/outdoor lounge that’s open all year long. 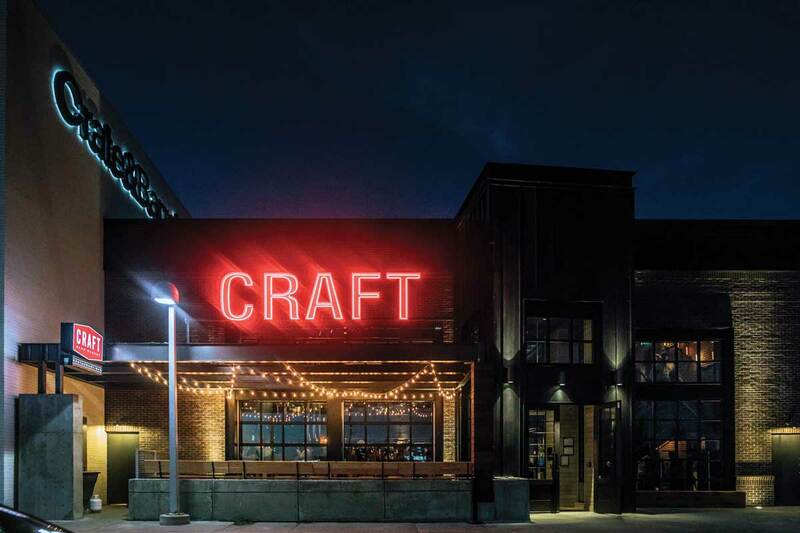 The enormous Craft location at Southcentre Mall faces the mall’s parking lot, giving beer lovers a superb suburban people watching opportunity. The 52-seat patio offers the restaurant’s core food and beer menu, including many local craft brews. 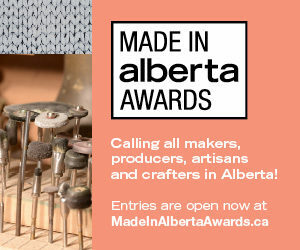 Situated on sidewalk level right in front of the downtown Bay store, The Guild’s huge patio offers some primo Stephen Avenue people-watching – a parade of working stiffs and tourists alike – while you sip a signature cocktail or dig into a plate of cold gin-and-tonic salmon. 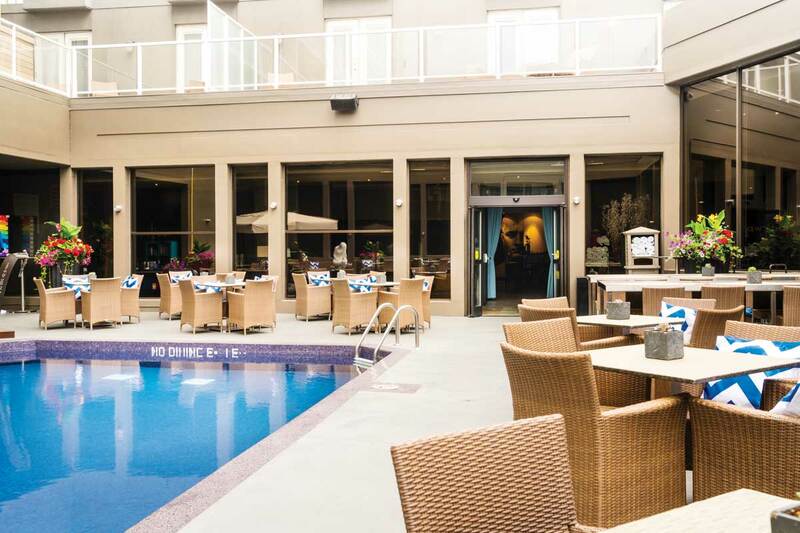 You don’t need to be a hotel guest (or even a swimmer) to enjoy lounging around Hotel Arts’ ultra-chic pool. Local socialites and out-of-towners alike can be found hanging out at the pool located in the hotel’s centre courtyard, ordering handcrafted cocktails and food from the custom poolside menu. 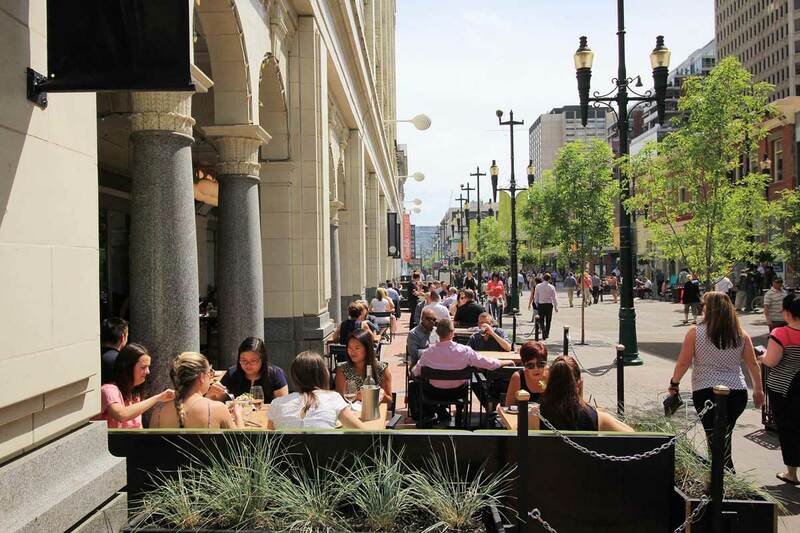 Thanks to the removal of a bank of escalators in The Core, Hy’s was able to expand its patio in the middle of the downtown hustle and bustle. Hy’s full menu (including that iconic cheese toast) is available outside as well. 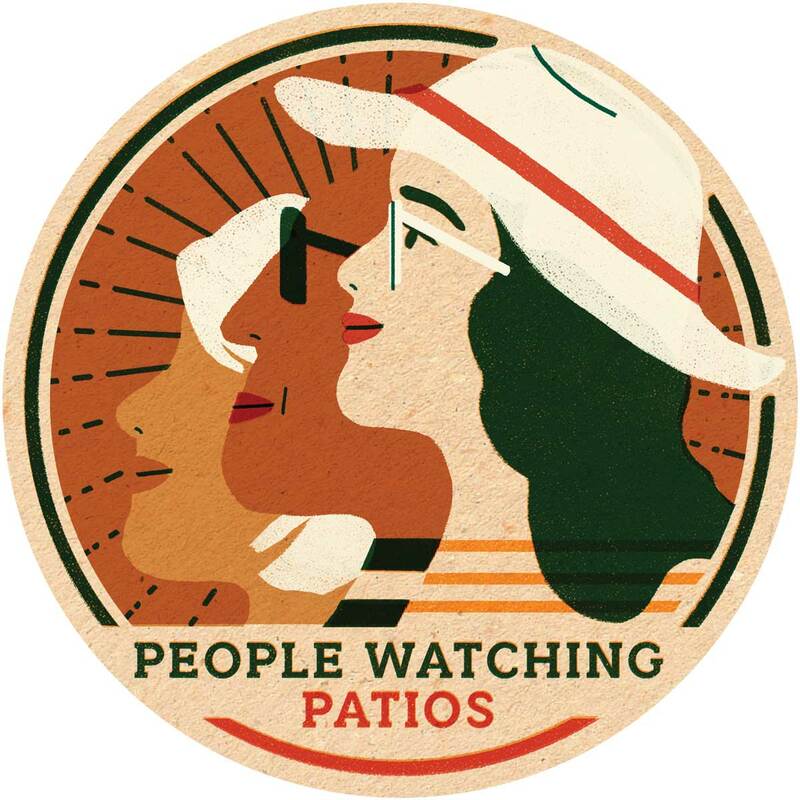 Big, busy and bustling, the patio at the Joey location in Eau Claire is a favourite of downtown office tower types who may or may not be knocking off early from work on a particularly gorgeous summer day. There are all manner of drinks on the cocktail menu, though there’s nothing quite like the signature Super Sonic Gin and Tonic or Super Nova Vodka Soda slushies to keep you cool. The Nash’s south-facing sidewalk patio faces a fairly quiet Inglewood side street for a less intense, though still interesting, people-watching (and, if you’re lucky, dog-watching) experience for those indulging in a summer dinner or a leisurely weekend brunch. Grab a seat at the large communal tables on National’s patio, where you’ll see people of all walks of life going down 17th Avenue S.W. 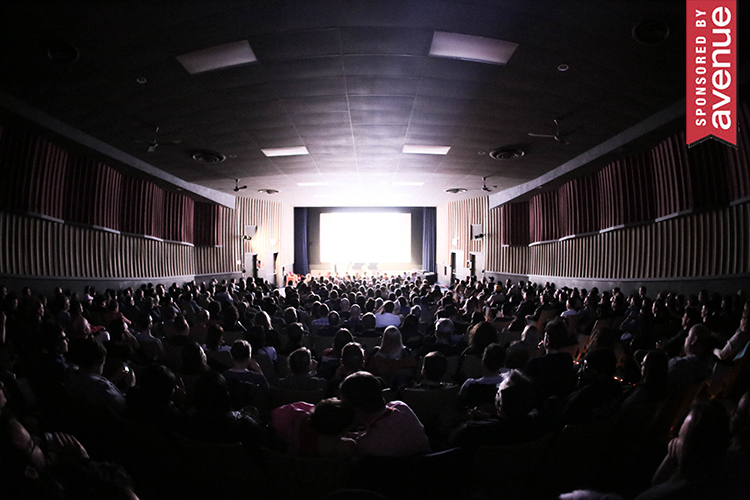 It’s more than enough to keep you entertained while sipping on a pint from National’s extensive beer menu or snacking on a plate of red-hot wings or two-bite corn dogs. Provision is a tiny restaurant, but its patio, spilling into Central Memorial Park, offers plenty of room. Guests can enjoy both the serenity of the park as well as a chance to take in the people walking in and around it. The patio at the former Melrose Caf was one of Calgary’s best people-watching perches. Royale, which moved in almost two years ago, has resurrected this prime outdoor space, offering the same great view of 17th Avenue, but with French brasserie-inspired fare.